Mae West once said, “A model’s just an imitation of the real thing.” If that’s true, then an encouraging trend is taking place both in the real world and in media representations: a rising profile for people with disabilities. Doris Stinga of FunnyFace Today, Inc. (FFT), the New York City modeling agency that books jobs for Ryan, says that over the past six years, use of models with disabilities has been increasing. According to Stinga, children with disabilities are in demand for both corporate advertising and other print outlets such as school books. “The current market in print advertising is for children with obvious disabilities that are visible in photographs,” she states. When ads feature these children, companies can communicate a clear message of inclusiveness. Irv Field, talent agent and co-owner of Elen’s Kids, another New York–based agency that works with FFT, says that any child is a potential model. A child simply needs a happy personality and the ability to follow directions.The FFT agency, which specializes in print and commercial modeling, has a division devoted to children and encourages participation from anyone regardless of disability status. “I solicit advertising agencies and companies on behalf of my clients,” says Stinga. 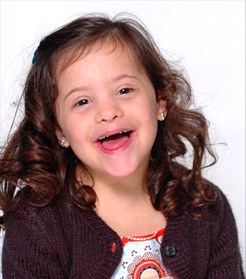 Among the child models she handles are those with Down’s syndrome, some who use wheelchairs, and little people. Although modeling as a profession has a reputation for promoting unhealthy body images, in the case of children with disabilities, the pursuit has often proven to be a self-image booster. In fact, some parents view modeling as another way to advocate for their children. Their view is that the more often children with disabilities are seen as participating in normal life, the stronger the message becomes that they are individuals not defined by disability. Travel expenses are not reimbursed to and from a booked shoot, generally held in cities with major advertising agencies like New York, Chicago, Miami or Los Angeles. Langford drives her son from New Jersey to New York City, a long commute. For Ukema, the drive is four and a half hours from her upstate–New York home into the city. Neither Ukema’s nor Langford’s other children are interested in modeling, so arrangements must be made for them each time the modeling child gets a call. Calls can come as late as the day before a shoot, so notice is often short. Finally, the photo shoots usually take place on weekdays, so parents must pull the child model out of school. Talent agent Irv Field agrees that “modeling, for children, is not about money. It is about making forever memories with a fun experience.” It’s also an occupation that’s easy to take up. No special classes or training are necessary. A good agent makes sure that all state child labor laws are considered. Modeling has more relaxed requirements than working on stage, radio or television, and for this reason offers a more welcoming opportunity for children looking to break in to the entertainment industry. Thinking about Modeling for Your Child? The sources contacted for this article specialize in print media. However, Doris Stinga of FunnyFace Today (FFT) has this advice for parents considering any type of modeling for their children: “Do not listen to someone who comes up to you in a mall and wants to take several hundred dollars worth of pictures to get your child started in modeling.” Legitimate agencies are licensed and bonded and will not charge a fee for photos. While not all agencies belong to local Better Business Bureaus, parents should check to see if there are complaints against an agency before signing up. Even infants are being used as models. And while of course, the better the photo, the better a child’s chances will be, a reputable agency will use most of the photos sent in to consider the child as a model. Both Amanda Langford and Paula Ukema sent their agents photos they had taken themselves of their children. However, for professional photos, a good agent can connect parents with a reputable photo service. Paula Ukema tried to act as her daughter Kyrie’s agent when she started out, looking around for opportunities in her area with manufacturers of baby products and the like. However, she soon decided that using an agent was worth the cost. Print agents charge a commission of about 20% or more on a shoot. The agent does a lot of work for this money, calling around to advertising firms and companies to find work for the child model. Once jobs start coming, parents should keep “tear sheets” (copies of the ads in which the child appeared) and prepare a résumé that lists each jobs the child has had. Those who are serious about a career in modeling will eventually need professional headshots or a composite photo card containing 5 photos. Classes in modeling for older children are always useful, but all of the agents we spoke with said that the only requirement for young children is that the child is happy and can follow directions. A child going on to stage, TV or film opportunities usually does need acting classes. A reputable agency will be aware of applicable child labor requirements and make sure that a child does not work longer in one day than the state allows. Several reliable agencies with children’s divisions are FFT, Ford, Wilhemina, Product and Elen’s Kids. Most require you to submit photos that will not be returned. Many will not acknowledge submissions unless they are interested in using the child. But with some diligence, a happy spirit, and a smile, your child might enjoy the life of a model, too.